I am going to share with you probably the best bar I've been to anywhere else in the world. It's located in the province of Krabi in Southern Thailand. If you're heading to Krabi and going straight for the backpackers and rock climbers paradise - Tonsai beach then you wouldn't miss this. 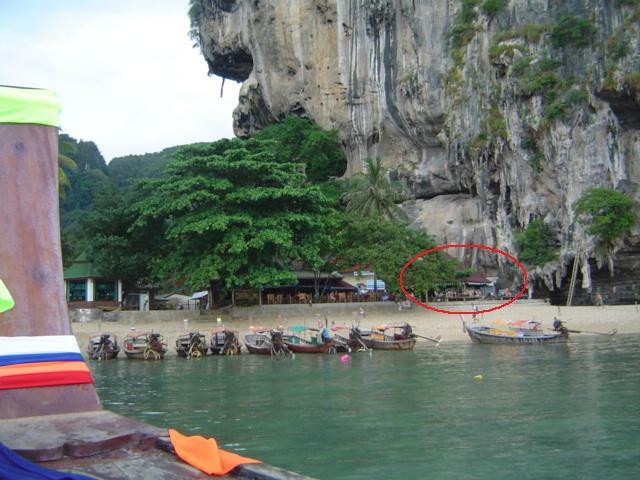 It's right smack in front of the beach just below the cliff rocks where climbers attempt to climb. Its amazing spot is a sure winner. What i like so much about this bar is the set up. Imagine you're on a holiday vacation or you've been walking the whole day and all you need is a good relaxing nightcap, then i think this is what you're looking for. Take off your slippers, stretch your legs and order a cold bottle of beer. It's the first bar i saw as soon as my boat docked in this island. I arrived in the afternoon where the bartenders were already preparing for a heavy night. Lights were all lit up. The music is just about to be bolted in high quality sounds, everyone was preparing for a seemingly huge crowd. There i met Chang. If ever you go here, he's the friendliest Thai local i met anywhere in Thailand. I actually think we're brothers because we look so much alike. And in my week stay here, we've been bumping anywhere from the foot of the mountain to the other bar in the forest. So if you do see him, say hi. I don't know if he still remembers me, though. You won't miss the sign. The green lights lighting up the etched on wood sign of Freedom Bar. Indeed for all the hippie, freedom thinkers, this spot is a good place to relax, watch the unbelievable sunset, and drink Chang, my personal favorite. And wait for the stars to wave at you as you look up. Beers cost not more than 100 Thai baht for a big bottle. It's not really cheap but with a view like this, trust me you're getting a bargain. If you're still wondering where is it actually located. Look below. The same photo but in the lower photo you will see its exact location. Just below the amazing cliffs. Hey man, your post brings back many memories. I'm planning to be in Tonsai 5th April to 20th May, 2010. I last visited Tonsai in 2007. Any idea what's become of the place i these three years? Has the beach been privatised and the big noisy construction started yet? Or did that never happen? Also, can one still pitch a tent up for the night, or is that not on anymore? I just need to be prepared for the worst. hey man, sorry for the late reply. been busy with work. as far as i know i was there last quarter of 2008 but to answer you, yes there was construction going on, i think they are fixing the sewage system back then because there was some foul smell but i bet everything's fixed now. the roads in the center is still not fixed. i could still remember walking in slight flood when it rained and hear the frogs making sounds. LoL also from last i hear the little huts and shacks up the hill not close to the beach are still there, still very cheap. although there is a tourism center there where you need to pass by if you want to rent a boat or something located near the bars infront of the beach. 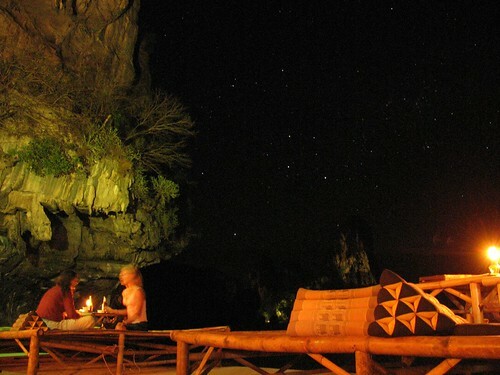 the commercial part is still in railay bay. yes, there were some who pitched on tent at the beach. it still has the happie vibe which i really really like. yes, its still possible to trek from tonsai to railay via the small opening a few steps away from the cliff climbers. i've always said this, still the most warm thai people i've met are in tonsai beach, hands down the most laidback chill environment ever. when freedom bar closes at night, everyone heads to the center of the hill where there's a little bamboo bar set up to get free drinks and do you know what. it still has that small community feel to it which is rather nice as compared to the convenience of commercialism. i could still remember the hotdog on stick that has rice on it, and the banana pancakes, and the best chicken fried rice by that old lady selling. i have a blog entry on tonsai somewhere, maybe you could read some info on it. just click thailand and find some memory of tonsai beach. I would like to hear from you again gene and good luck on your trip. send me a postcard bud!